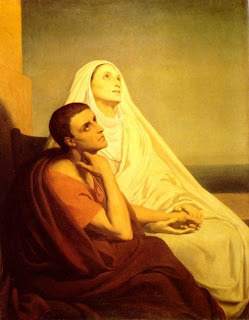 St. Augustine begins his recollection of his mother’s life not by praising her in herself, but by praising the work of God in her – “I will speak not of her gifts, but Yours in her; for she neither made herself nor educated herself.” The glory is to be given not to St. Monica, nor even to her parents, but to the Lord. In order to fully establish this point – that the good done in St. Monica must be attributed first and foremost to the glory of God – St. Augustine begins his remembrance with a certain vice which had plagued his mother for some time. What love did this son have: He told the whole world of how his mother had, for a time, been too indulgent in her consumption of alcohol. “And yet – as Your handmaid related to me, her son – there had stolen upon her a love of wine.” The Bishop of Hippo recalls this vice not unto his mother’s shame but to give glory to the Lord of all. Indeed, St. Monica was cured of the vice not by her own effort, nor by the encouragement and support of her family or friends, but rather through the harsh and uncharitable rebuke of a bitter servant girl – and this proves that it was the Lord who saved her! “On the ninth day, then, of her sickness, the fifty-sixth year of her age, and the thirty-third of mine, was that religious and devout soul set free from the body.” (Confessions IX, 11) So St. Augustine relates the death of his holy mother. Having begin with the admission of his mother’s human weakness, so too St. Augustine ends with pious prayers for the remission of her sins and her happy repose. When St. Monica had so helped her son in this life through humble petitions, how could he refrain from aiding her unto heavenly bliss through the same? Aloha, this is just so beautifully written!! Thank you. A timely reminder of the role that parents play, especially mothers, in inculcating the faith in their children. The Catholic Encyclopdedia says that there used to be an Association of Christian mothers under the patronage of St. Monica whose object was mutual prayer for sons and husbands who had gone astray http://www.newadvent.org/cathen/10482a.htm. I don't know if this association still exists - google didn't seem to throw up any relevant results on it - but if it has fallen into abeyance, perhaps it would be no bad thing for it to be brought back.